Lucy's Kitchen Notebook: It's Home Cooking, Baby! Ian got so lucky to be born in the winter, because Autumn is just the best season ever for a person to taste food for the first time. People ask me when the perfect time of the year is to come to Lyon to visit, and hands down I always say Autumn. The vegetables we get at the end of summer are still out in their glory and even better, then come the big pumpkin-like squash varieties sold in thick wedges. Wild and cultivated herbs are burgeoning from the stands in huge bouquets, the onions are still fresh and green, there are leeks of every shape and size, peas, beans of all kinds, shell beans, green beans, butter beans and fresh little green peas that are such a pleasure to break out of their little shells. Fruits of all hues are laid out in their pretty little flats - Mirabelle, apricot, reine claude, quetsch, along with all manner of berries. The stone fruits are great for compote, and of course apples of every variety sold straight from the orchard along with their juice in bottles. We see things gearing up in the spirit of the season's game at the poultry vendor. An expanded variety of fowl becomes available to mimic the hunting season even if a great deal of what we get here in the city is raised on nearby farms. Yes, it is the perfect time for introducing Baby Ian to the concept of flavor. There's only one first time, and the stars aligned and shined down upon us just so to make this first eating season the best it can be. I admit that although a baby-led schedule is the thing these days, I must have my daily rituals. The faster I've been able to guide his schedule into something predictable and regular, the better. What we've gotten in the habit of doing is getting up bright and early, heading to the market together. When we arrive home, he's had a ton of new experiences. Every week brings something new to look at, feel the texture of, listen to, or smell. Every day his depth of vision changes, one day he's staring at the jagged symmetrical patchwork of pastel coated cityscape shapes and forms, the next he's fixed on a stack of fruit or trying to make eye contact with the people talking along the rows of the market stands. In any case, He's always ready to happily snuggle into his little sleep sack and go straight to bed to dream of what he's just seen once we've climbed the marble stairs with our market pickings, and it's then that I get a little work done. Ian eats something different for lunch every day. At first I was flopping back and forth about going ahead and just buying the little jars. It really wasn't what was in them, but what they were empty. I could hoard them and clean them and paint the caps, stack them and use them for everything from stray buttons to paprika, nail their tops onto boards and keep tacks and buttons and little pebbles from the sea organized neatly in rows that hang suspended this way and that. I could use them for my own house compote, jellies and jams. Make dollhouse guppy aquariums. I stacked these little jars up in beautiful symmetrical pyramids in my mind, built a little castle of sparkling glass baby food jars. I finally made it to the store and began to investigate the pots of baby food, thinking that here in France, where so much attention is paid to fresh and unadulterated in what we eat, picking out baby food would be easy. I went down the aisle, trying to imagine the home-style French recipes touted on the labeling, "ideas from mothers" and the likes. Oh how lovely. Pot au Feu, Couscous, Simmered Rabbit, Blanquette de Veau, Classic Auvergnat Potato and Leek Puree, etc. I picked up the lovely little glass jars and turned them around, to read these ancestral recipes. Slap, slap! Whoa! Jar after jar of delectably named pastel colored purees in their cute little glass pots down the aisle kept jabbing me with lists of cheap fillers, and the mysterious E# additives. Why have 7 ingredients when the label says "Haricots Verts"? Oh I know, logistics, distribution, storage, shelf time and whatnot. The need for a jar of baby food to sit unrefrigerated in a crate under varying environmental conditions for 2 or 3 years at a time. "Lucy, for goodness' sake, people are raising perfectly healthy babies on these pots of baby food. You have work to do. Trust these reputable companies, they have done extensive research, they are the ultimate authority on what is truly good for your baby. And you get to collect the cute glass jars with lids." "Yea, like I trusted Betty Crocker and Duncan Hines as the ultimate authorities on cake baking until the day I discovered butter sugar eggs and flour?" I was failing to make the leap of faith with these foods despite the promise of baby food jars, and even the organic ones that tout no additives, no freaky ultra-refined starches and sugars, nothing - but a whole lot of money. Blame it on my knowing just how hard it is to steam a green bean. The decision was made to just go ahead and instill some habits - I mean that's really all it takes, to cook for him like any other normal human being. A little research was all it took. At the beginning I felt a little beaten down by the sensational stories of danger. The risk of acute allergies, intolerances and hazards of all kinds lurked in the shadows. Feeling a bit overwhelmed I let myself feel a resistance to what I thought might turn into a dreaded chore. It's one thing to cook for the love of it, but another to be slave to a baby who believe me, will scream bloody murder if lunch is five minutes late. To have to cook things a certain way, in certain quantities, with certain ingredients, ho hum. My last bit of resistance was kind of a devil sitting on my shoulder giving his last ditch effort, coming out of that knee jerk "if the government hasn't banned it then it can't be that bad". But every time I went back to the grocery store aisle, I found myself reading one label after another and firmly putting them back on the shelf with a bad gut feeling. How can I feed this to my baby when we have such great fresh food available to us, especially at this time of year? It basically would be the equivalent of me subsisting on canned food throughout the harvest. Sure, I should probably carefully pick a few of those expensive pots of prepared food and tuck them in the car, in the cupboard, and in the pantry at the country house to use in case of a snafu. For example not being able to get Bernadette going (our wood stove in the country house) or a traffic jam, or some otherwise unplanned event that prevents me from cooking lunch in advance. But for the most part, it's home cooking, baby! It was a big relief when Ian's doctor, obviously having been bombarded with questions from mothers like me, handed me a full style sort-of-personalized home cooking regime for him -- instructions on how to get him started. While the detailed rundown did not contain recipes, it did list the doctor's knowledgeable guidelines. He is an advocate of home cooked purees (whew), adding various fats, meats in age specific quantities, and sometimes fresh potato as a neutral textural liaison. He included a list of fruits and meats to avoid in his first 6 months of eating, and a nice little section on oils, the ones I should be adding for my baby's brain growth, some raw, some able to be cooked. It was a great help for me, a metaphorical springboard from which I could feel confident as I began to create. Don't get me wrong. Baby food is as simple as simple can get. The formulas and ratios are all straightforward and pretty much common sense. It isn't salted or seasoned because baby can't metabolize salt and spices are for later. 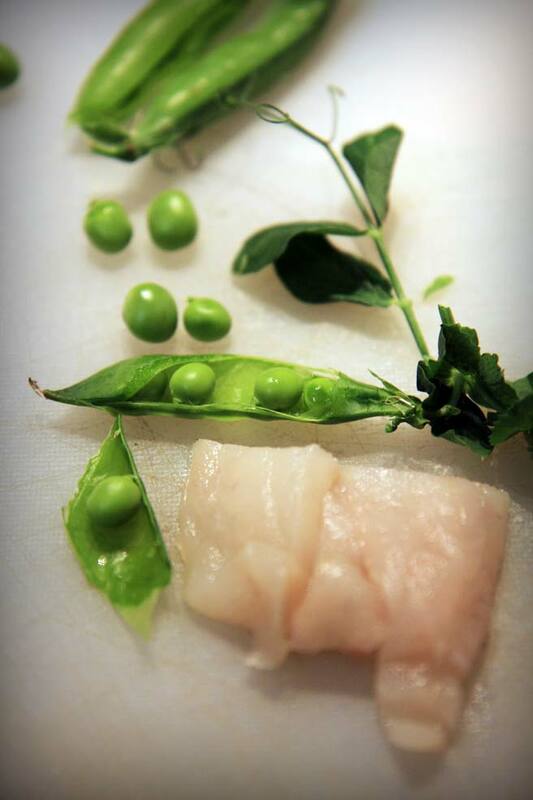 Keeping things simple, controlling texture and temperature, and easing new flavors in is the key. My doctor stressed variety and respect for the baby's taste and appetite to launch him into good French habits. Instead of the old adage that any new food should be fed to baby for 5 days straight, the doctor simply said no more than one new vegetable or meat a day. Ian has never had the same combination twice, except for a few things that he simply adores and it would be cruel to deprive him of, for example turkey and butter beans. I have taken a great interest in the printed literature on offer here in France on the topic. That, with our having been on the grand tour to meet the whole family both in the States and in France has taken up all of my time these past few weeks, I hope my regular readers will forgive me. Things promise to settle down and get more productive promptly. Now that we're back into the rhythm of the rentree, I am finding nooks and crannies of time to concentrate. Ian contemplates the merits of maman sticking a camera in his face when he's busy eating. My fishmonger says that plaice is a great first fish for baby, along with sole and halibut, because the fillet doesn't have any bones. 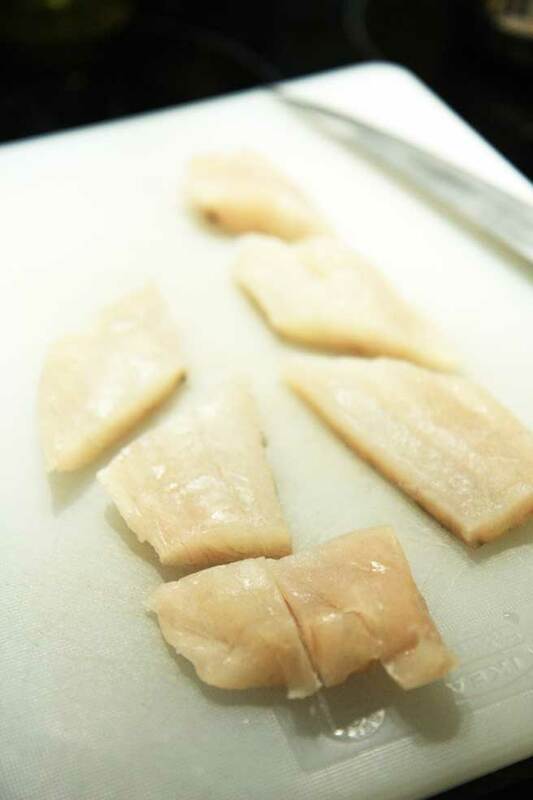 One small fillet of plaice (125 grams) will make 5-6 meals for your baby. 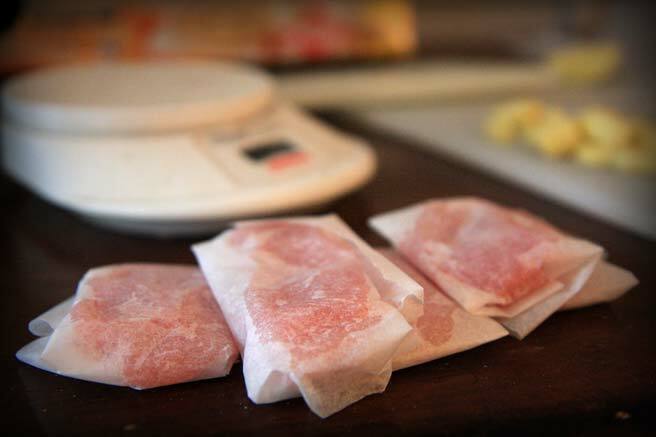 Once you've got it home, cut it into 20-25 gram portions, wrap each piece in parchment, and store it in the freezer. That way, whenever you want to serve fish, you have it available. * About oils in baby's food: Young babies need them for brain growth, and choosing a variety of oils is a good thing. My doctor recommends incorporating oils one at a time, but alternating them constantly: butter, duck fat, olive oil, sunflower, colza, walnut, sesame. He says to avoid peanut, palm and coconut oils. Olive, Walnut, and Sesame oils should be added after cooking because of their low smoke point. * About potatoes: Reccomended by the doctor as a liaison for consistency, I arrived at my measurements for potatoes in accordance with my baby's body and tastes. I try to use only just enough to give my puree a satisfying mouth feel, and barely ever exceed 40 grams in a recipe. I have tried the various varieties and find that a waxy more flavorful potato appeals to my baby more than the powdery varieties. Your baby might have a different idea, however! Follow his tastes and watch his diaper for signs that your baby could cut down on potato, you'll know it right away. * About cooking water for baby: We had our tap water tested before Ian came home, and found that since we live in a building built in the 1800s, indeed the water is not safe for baby to drink (trace amounts of lead from water that's been sitting in the pipes, we didn't want to take any chances!) Ian's pediatrician recommends spring water that has low mineral content for the baby's bottles since young babies don't metabolize minerals well, so we cook with it too. From what I understand, filtering the water is just fine too. Shell your peas and weigh them. You will be surprised at how many peas you'll shell to get 120 grams. Peel the potato and cut off as much as you'll need, using the scale to measure. 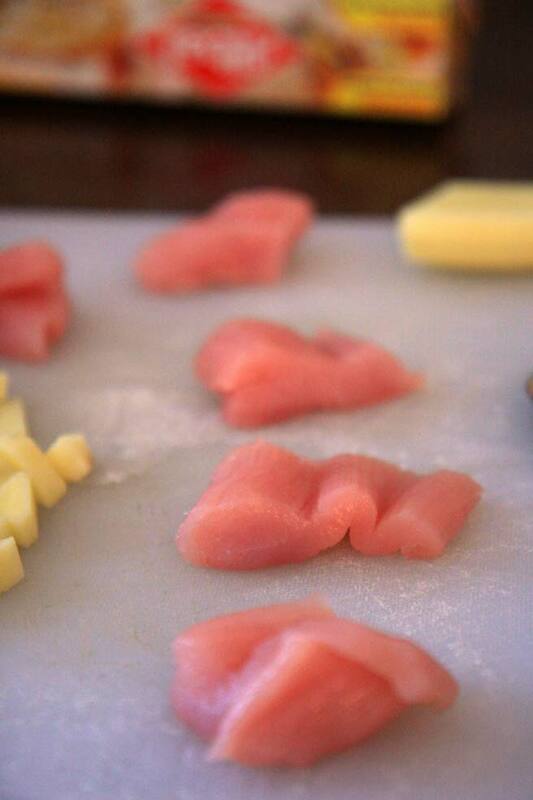 Bring out your little portioned fish fillet. Heat saucepan over medium heat, and spread a thin layer of colza or sunflower oil over the bottom of the pan (you may choose cooking spray for this). Sprinkle the potatoes around it. Keeping the heat at medium, let the meat and potatoes sizzle until just browned on the bottom, then add the water. Stir the liquid around, scraping up any bits along the way. Add the freshly shelled peas, add the cooking liquid, toss to coat, and turn up the heat until the water at the bottom boils fast. 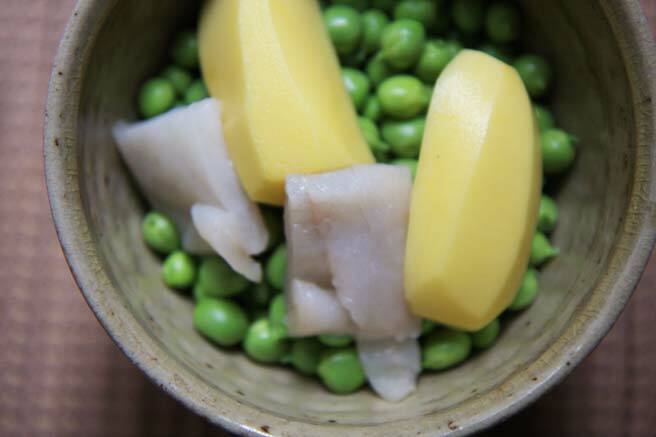 Immediately reduce the heat to low, tightly cover, and let the peas smother in the steaming cooking juices until both peas and potato are good and soft, about 12 minutes. Make sure the vegetables are fully cooked to soft, because this makes a better mouth feel and easier digestibility for baby. 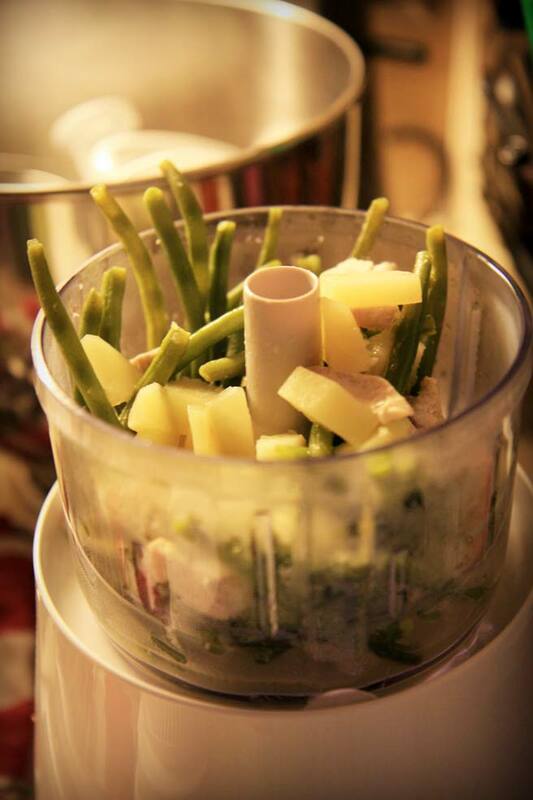 Put the mixture in your blender or grinder, add the olive oil, and puree to smooth. Let cool to warm, attach the bib around your baby's neck, and serve it up! Wash, peel and dice the potatoes, and dice the turkey. Wash and remove the rough ends from the haricots beurre, and then slice them into 1/2" lengths. Melt the duck fat over medium heat in a 1 quart sauce pan with lid, and spread the turkey and potatoes over the bottom. Keeping the heat at medium, let the meat and potatoes sizzle until just browned, then add the water. Stir the liquid around, scraping up any bits along the way. Add the beans, toss to coat with the cooking liquid, and turn up the heat until the water at the bottom boils fast. Immediately reduce the heat to low, tightly cover, and let the beans smother in the steaming cooking juices until both beans and potato are soft, about 12 minutes. Make sure the vegetables are fully cooked to soft, because this makes a better mouth feel and easier digestibility for baby. Puree to smooth in your blender or grinder, let cool to warm, and serve! I actually taste tested French baby food, in the interest of investigation, and it was, as I wrote here http://frenchletters.wordpress.com/2007/12/04/les-bebes-francais-mangent-ils-bien/ mostly horrible. And definitely salted. I'm sure Ian is way better off with your cooking! Coincidentally I decided a few minutes ago I would leave a message (after all these weeks!) asking if you, Loic and Ian were OK. You are one of the few blogs I have ended up following after so many to begin with a few years ago! To my joy there was today's lovely post. I looked several times and missed your very special descriptions of life in Lyon. I knew you had gone back to the States but it seemed such a long time! Today's account was delightful. Your writing is exceptional! What a delicious, warm homecoming!! This was just lovely---your usual care and contemplation of a recipe, a method, and the love for the recipient of all these caretakings---they come through and wrap us all in a warm hug. Thank you for this---our two youngest Grands have both just turned two, and they've been the Deep-South counterparts of your Ian, with peas and butterbeans (do we mean the same vegetable?---I've never seen the whole bean used this way, just the fat nuggets shelled out and cooked to soft morsels of buttery delight) and even a bit of biscuit or cornbread included into their daily fare, and now---they're little Redneck gourmets all the way, gladly gobbling up fried okra and catfish and all sorts of Southern-cooked vegetables. I mentioned your lovely blog in LAWN TEA a couple of weeks ago, with a link and a hearty recommendation to my own readers. I'm so glad you're home, and know the family was all delighted to meet your darling Boy. Do you have a link to the info the dr gave you? or could you share it? I know quite a few people who would love that information. Yes , having my third baby in Spain and loving Spanish food , I thought the odd jar would be a handy standby and a nice introduction to local cuisine . EUGH !! I still , years later , vividly remember the smell of something supposedly spinachy ..... just like a dirty ashtray and totally unlike anything I'd ever eaten in any Spanish cafe , restaurant or home ! I second Kyrsyan's request - I've had the hardest time finding a reliable list of real food options for my 6 mo old son. I'd greatly appreciate seeing the list from your pediatrician. Congrats on your beautiful boy. Glad to ee you are back! Ian is off to a great start. Just in case you are or were worried about this subject's popularity -- I don't have children, or ever intend to, but I found it a fascinating post. Thank you for sharing your decision-making and meal-prep process with us. I'd respectfully disagree about the spice though. We have a 7-month baby who absolutely loves food, but he does require some seasoning to it. 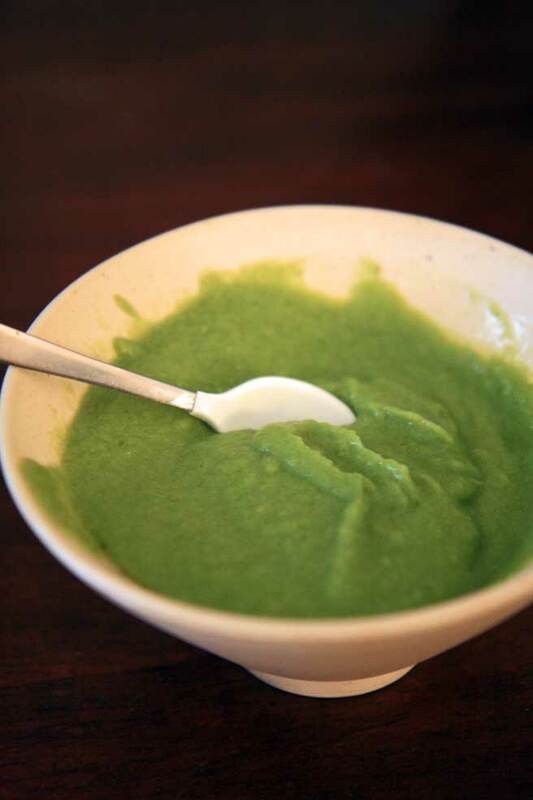 Your recipes sound delightful and tasty, but sometimes we simply give hime some mixed vegetable puree and adding chopped fresh dill, basil, oregano, parsley, pepper or anything similar makes him love it. (Basil leaves he wants to eat off the plant!) I guess it's also about baby's individual taste. Also we already feed him our own cookings - we simply add salt later to our portions. He loves combination of tomato and garlic in soups, and oven-baked vegetable dishes with cream and pepper are also great. Thank you for inspiration and wonderful blog - I subscribed years ago and am still delighted to find there's a new post! So glad to see your darling boy and to hear from you! Amazing how much we can struggle/stress over feeding our babies. I think it is much to realization that we are responsible for this little life -- we SO don't want to mess up. I fed mine mostly homemade food and had lots of fun with the process. We did use the jars sometimes. I'm sorry to say the baby in question rarely seemed to care which she/he was given, so long as it wasn't "five minutes late." Welcome back! I saw a picture of Ian and Kieran on Fran's blog and they are adorable. I made most of my children's food when they were infants and it's a great way to control additives. You also get to direct the exposure they get to different foods. While I wasn't militant about never using the jars, we really used mostly freshly made foods that we would eat ourselves. My babies have grown up to be adults who are picky in a good way about the food they eat. Have fun with Ian, he looks like a cutie. Love the picture..he looks like a Kewpie doll. I could not feed my children something I find revolting so there went the jars; with two children I found one single jar we liked as a stand-by for emergencies, otherwise it was home-cooked food - extra meals are hardly an inconvenience and you're quickly into cooking things you all like. Ian's meals sound great (a salted portion for me, please)! What greater joy and priviledge than to introduce someone you love to the magical world of food... Well done, Zeralda. I'm so please that you have chosen to feed your little Ian in this way. He will grow up strong and healthy with a real appreciation for real food. And then, there's your writing about it. What a wonderful boon to new moms who might just need that little nudge to give up the jars of baby food and head into the kitchen. Well done! My grandmother would steam some potatoes or pumkin, when soft she would lightly sprinkle some finely ground coriander and cumin 2:1. Then pureed with a little of the water or homemade yoghurt. She also mashed in some ghee (opt). Anything steamed and mashed (spinach, fish, lentils, peas....) would be mixed through and I apparently relished every mouthful. I had the same enthusiastic results with my kids, graduating to other spices and herbs as they grew older. Gotta be better than those jars. Very nice contribution. Thanks, Lucy! I had the same thoughts and doubts 10 years ago, and 5 years ago when we had to do it all over again, it was home cooking all the way for us too. What a lucky (and adorable) babe! all that time, i wondered how my grandmother raised five children (all born before world war 2) in the mountains of the island of crete: is this how she fed her children? for a start, there were no paediatricians to listen to! when the second child came along, I let her handle the food we were eating at the table: her first non-milk meal was a mashed haricot bean! Welcome back and thank you for an informative post. I also had the same concerns and similar thoughts about what was done before convenience foods. Mine was a spice lover, but I ate very spicy foods while pregnant and while nursing so maybe that made a difference. Today as a young man he is not overly interested in food, but will not eat anything tasteless or poorly done. Baby Ian is a treasure. Thanks for all the great comments, friends! I have made a correction in the name of the bean -- in French it is Haricots Beurre, but that does not translate to butter beans in English. It's great to hear your input about the choices you finally made. The doctor's guidelines are not really very specific but as I experiment I will keep updating with ideas. Ian is a lucky and beautiful baby. http://sunshineandroses-rockinloubylou.blogspot.com/ I am absolutely ASHAMED of my poor quality photography when I see your amazing photographs. Must hit Amazon to get a book about how to use a camera properly! Your comments mean a lot to me! Thank you, Anon, for your correction on the salt. I still don't salt his food, he doesn't seem to need or want it, but one of these days I will teach him the sign for salt and he can tell me how he likes it! As for posting the guidelines given to me by the doctor, I haven't gotten around to reflecting on how to translate it. In some ways the cultural context takes some explaining -- I'll be working on it. What a different experience than here in Canada. Our public health system provides you with a lot of information on introducing foods, with encouragement to make your own. My advice for you as you move through this is to add texture as soon as possible. 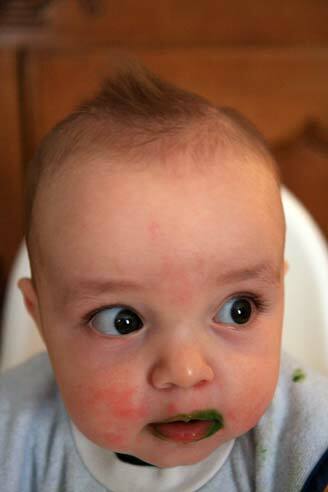 Many babies who have smooth purees for a long time will resist texture and then meal time becomes a battle. Start offering those peas for finger foods too. Thanks Cheryl. I am certainly not short of advice in my situation. We're doing fine. I am thoroughly enjoying following my common sense and watching my baby thrive. It's funny that common sense was just mentioned, because common sense to me is not pureeing a baby's foods and not spoonfeeding it to them. Babies will eat food when they are ready to eat food--when they are ready to pick it up with a pincer grasp, when their tongues no longer keep solid foods from entering--no need to change its format! But that is just a philosophical difference in common sense, of course!